John William Waterhouse (1849-1917), Circe Invidiosa (1892), oil on canvas, 180.7 x 87.4 cm, Art Gallery of South Australia, Adelaide, Australia. Wikimedia Commons. 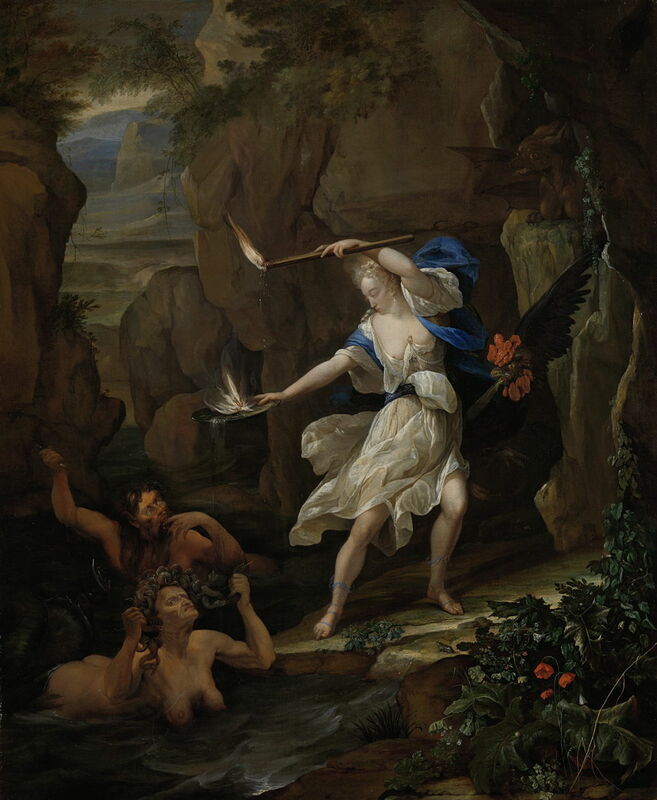 As he ended Book 13 of his Metamorphoses with Scylla running off from the advances of Glaucus, Ovid starts Book 14 with Glaucus trying to use sorcery to make Scylla love him. For this, he turns to Circe. Rejected by the scared Scylla, Glaucus travels from Sicily to visit the sorceress Circe. He implores her to use her dark arts to force Scylla to return his love. But Circe refuses, telling Glaucus to woo another: as she, Circe, is in love with him, in spurning Scylla, Glaucus could love Circe instead. Glaucus rejects her advice and her proposition, saying that nothing will change his love for Scylla. then saw her loins defiled with barking shapes. and shaggy backs encircle her shortened loins. of Circe, she robbed Ulysses of his men. which to this day reveals a craggy rim. And even the rock awakes the sailors’ dread. With Scylla’s lower half transformed into a pack of dogs, she takes some of Ulysses’ crew as they try to pass, but lets Aeneas through. She is finally transformed into a rock, and becomes a famous hazard to navigation. With the story of Scylla and Glaucus already popular, and Circe well-known in art from her earlier encounter with Odysseus during a previous section in Homer’s Odyssey, this short conclusion to the tale of the couple has also been quite a popular basis for paintings. John William Waterhouse chose to portray the figure of Circe the sorceress in his Circe Invidiosa (1892). Despite its narrative limitations, this offers a marvellous insight into the character of Circe, as she pours her brilliant emerald green potion into the water, ready for Circe to come and bathe. John Melhuish Strudwick (1849–1937), Circë and Scylla (1886), oil on canvas, dimensions not known, Sudley House, Liverpool, England. Wikimedia Commons. 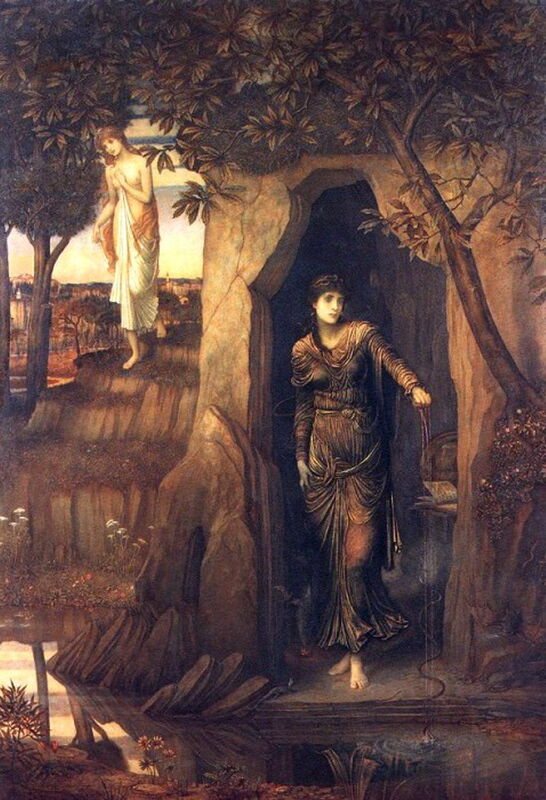 John Melhuish Strudwick also chooses a moment early in Ovid’s story, which makes his painting of Circë and Scylla (1886) narratively rather thin. Circe, dressed in brown rather than blue, is sprinkling her potion into the water from within a small cave, as Scylla, at the left, walks down to bathe. Antonio Tempesta (1555–1630), Scylla Changed by Circe’s Spell (1606), etching in illustrated edition of Ovid’s Metamorphoses, plate 131, 10.4 x 11.5 cm, Metropolitan Museum of Art, New York, NY. Wikimedia Commons. Antonio Tempesta’s etching of Scylla Changed by Circe’s Spell (1606) for an illustrated edition of the Metamorphoses is faithful to the text. 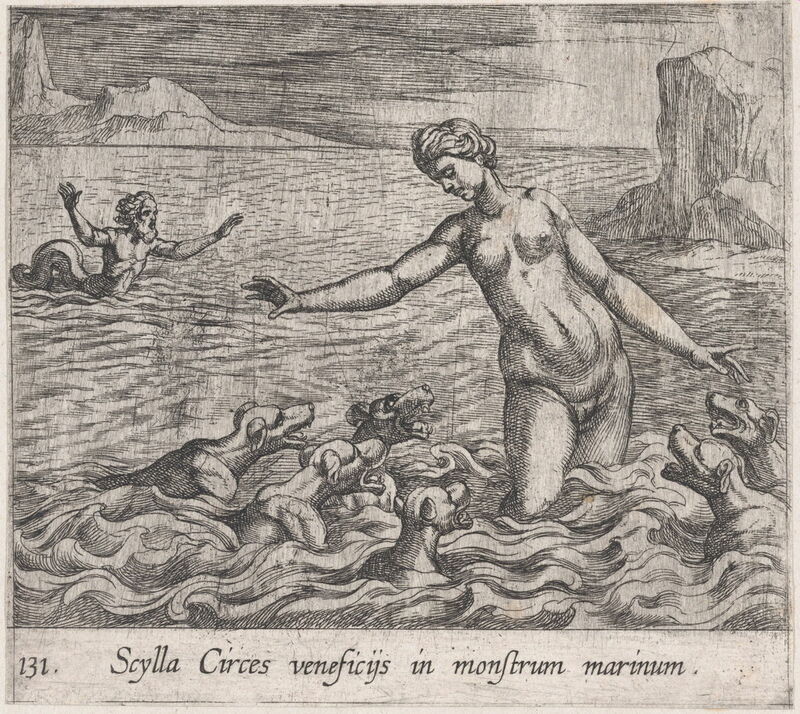 With the horrified Glaucus in the distance, Scylla is surrounded by half a dozen wild dogs as she bathes in the sea. Eglon Hendrik van der Neer (1634–1703), Circe Punishes Glaucus by Turning Scylla into a Monster (1695), oil on canvas, 64 x 53.3 cm, Rijksmuseum Amsterdam, Amsterdam, The Netherlands. Wikimedia Commons. By far the most complete visual account is Eglon van der Neer’s Circe Punishes Glaucus by Turning Scylla into a Monster (1695). Circe takes the limelight, as she casts her potion from a flaming silver salver held in her right hand. Dripping onto that is the wax from a large candle, held in her left hand. In the water below, Scylla has already been transformed into a gorgonesque figure, with snakes for hair, and the grotesque Glaucus watches from behind. Above and to the right of Circe is a small dragon perched on a rock ledge. 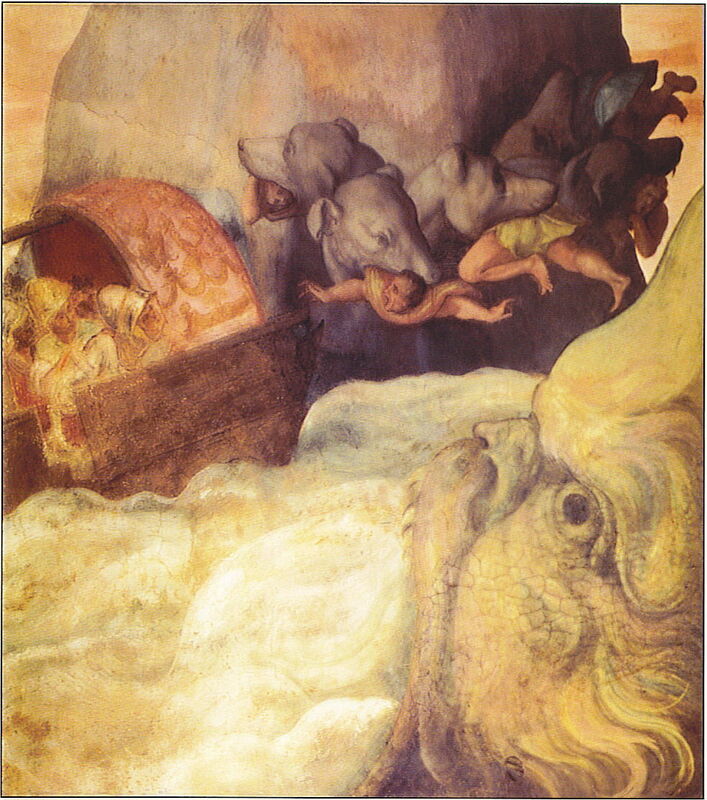 A few artists preferred to paint the end of this story, with Scylla turned to a rock and paired with Charybdis, threatening Odysseus’ ships and menacing passing mariners. 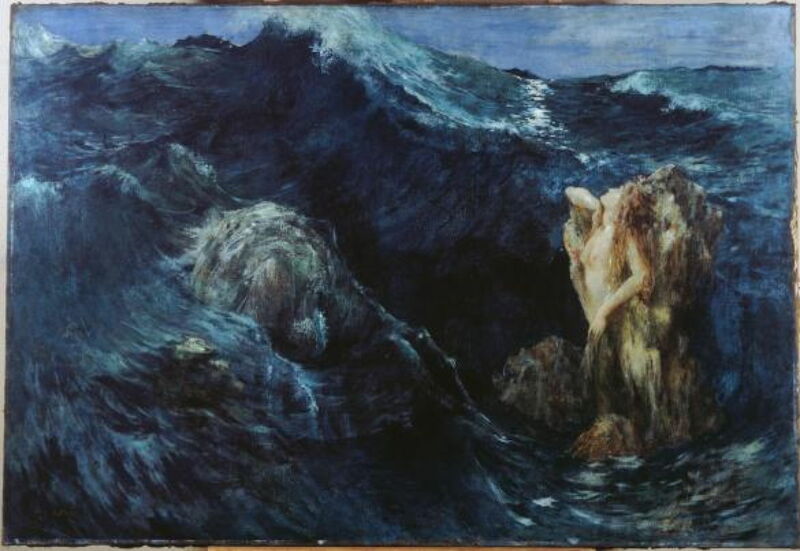 Ary Renan’s Charybdis and Scylla (1894) shows Charybdis the whirlpool with its mountainous standing waves at the left, and the rocks of Scylla at the right. Alessandro Allori (1535–1607), (Odysseus passing Scylla and Charybdis) (c 1575), fresco, dimensions and location not known. Wikimedia Commons. This fragment of fresco by Alessandro Allori shows Odysseus’ ship passing Charybdis, depicted as a huge head vomiting forth the rough waters of the whirlpool at the right, and the dogs’ heads of Scylla, which have captured three of Odysseus’ crew. 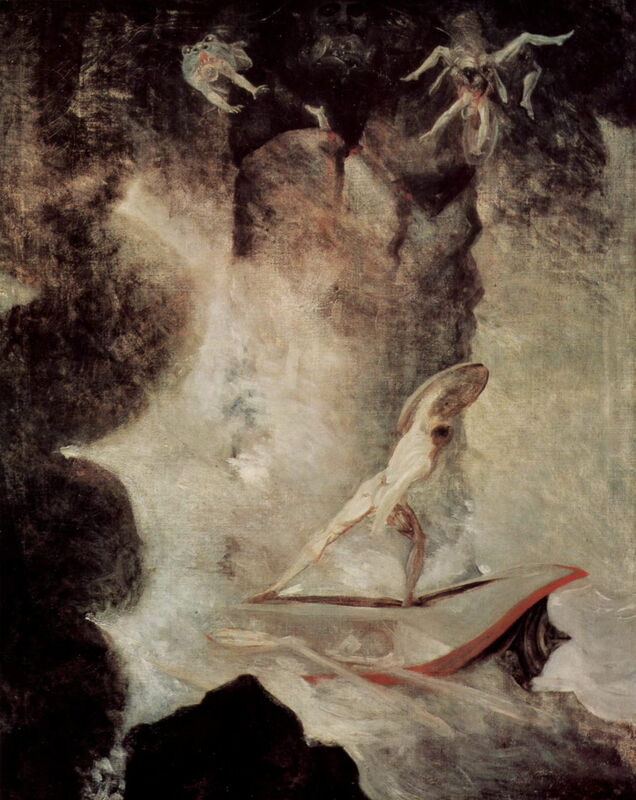 Henry Fuseli (1741–1825), Odysseus in front of Scylla and Charybdis (1794-96), oil on canvas, 126 × 101 cm, Aargauer Kunsthaus, Aarau, Switzerland. Wikimedia Commons. Henry Fuseli’s Odysseus in front of Scylla and Charybdis (1794-96) is another vivid depiction of Odysseus passing the twin dangers. He stands on the fo’c’sle of his ship, holding his shield up in defence as the oarsmen down below him struggle to propel the craft through the Straits of Messina. Of course Odysseus did make it past Sicily, and Aeneas and his crew do so too, to move on to further adventure in the next story in Ovid’s Metamorphoses. Posted in General, Language, Life, Painting and tagged Allori, Fuseli, Metamorphoses, myth, narrative, Ovid, painting, Renan, Strudwick, Tempesta, van der Neer, Waterhouse. Bookmark the permalink.